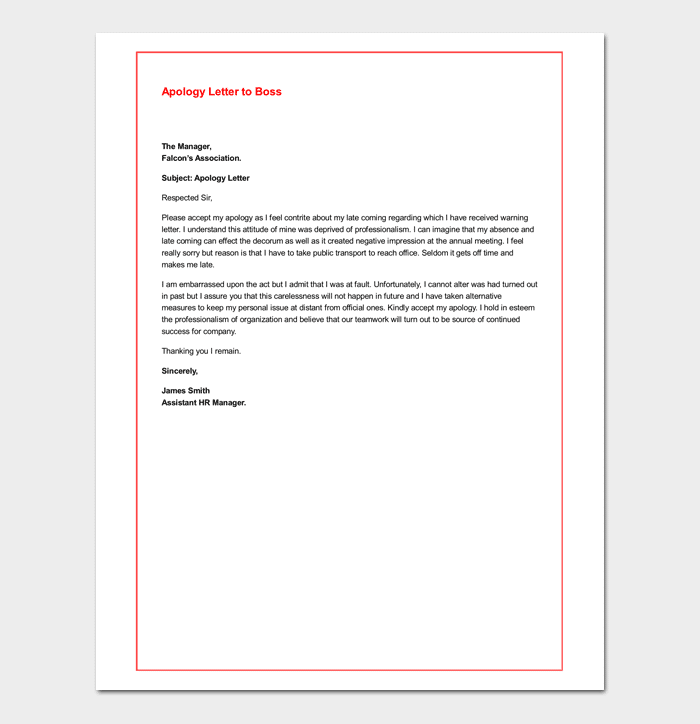 A well written apology letter to a boss is an essential way that employees can help correct a damaging or embarrassing situation. It is a chance for the employee to re-establish trust with their employers, as well as a sign of integrity. Let’s face it, mistakes happen, words are said that we wish we could take back, and actions are performed that we wish never happened. As members of the human race, these things have to be accepted as part of our daily life. When these mishaps occur at our place of business, it does not matter whether the incident was our fault or not, the very act of apologizing to our boss is a professional way to attempt to rectify the situation. Composing such a letter is not difficult, in fact it is quite simple. 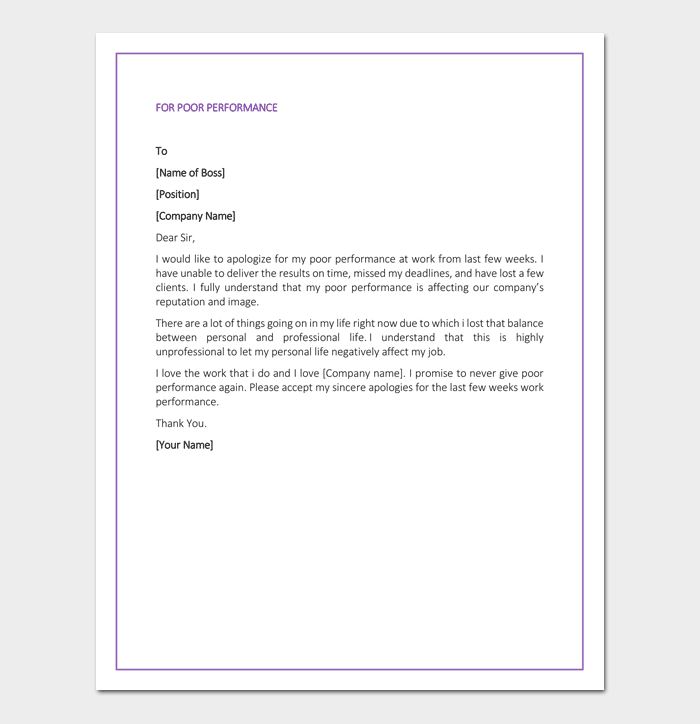 By ensuring that your apology letter to your boss has each of the above components, you’re well on your way to composing a thoughtful, professional letter which will have a positive impact on your employer/employee relationship. How to apologies to your boss for being late? 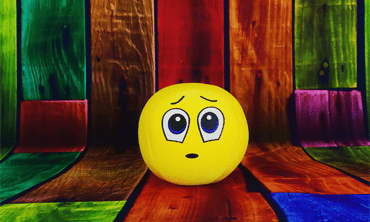 How to apologies to your boss for being rude? How to apologies to your boss for poor performance? 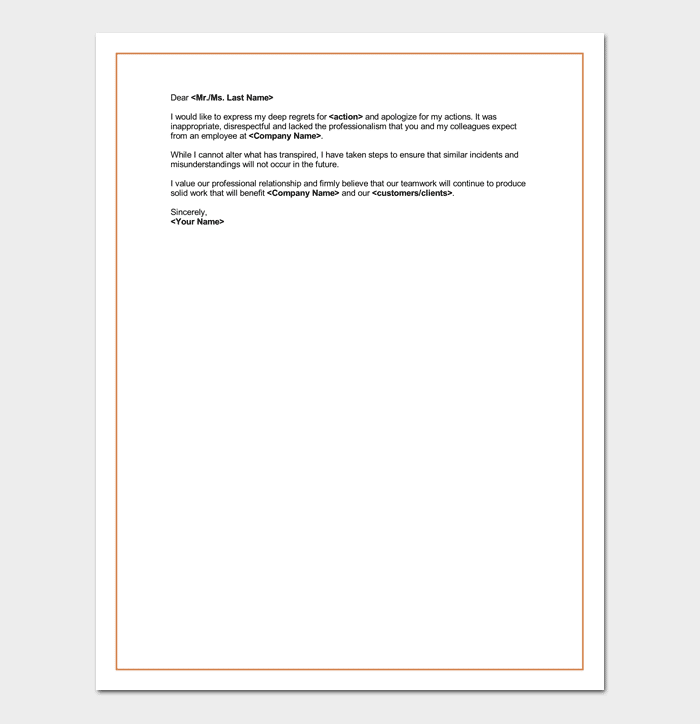 This is a letter written to a boss by a staff under them informing them of something that has not been achieved as per their direction. This letter covers the main issues, deliberates on the measures and specific time line to be allowed to make it. 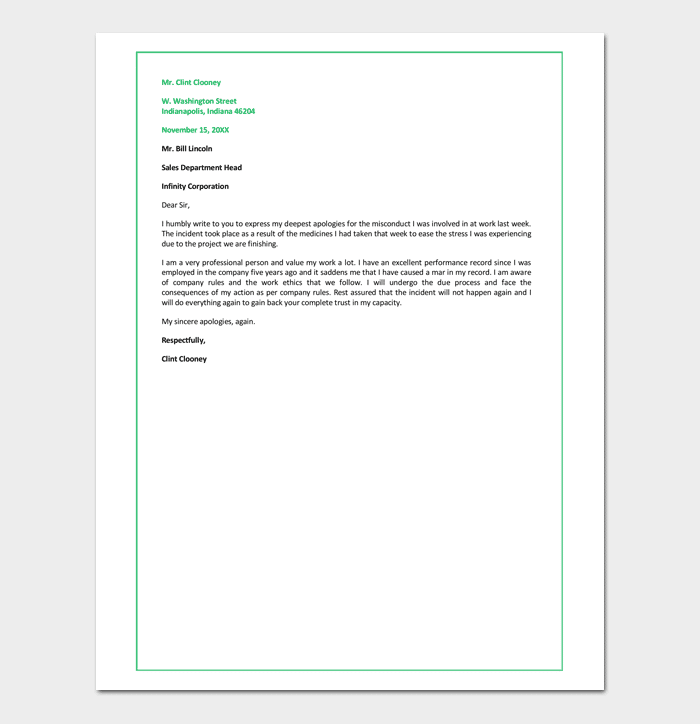 This apology letter format is addressed to the boss or the head of department/manager in forming them about poor performance. It captures reasons for the failure, constrains that could have led to it. It emphasizes on why the specific target was under met and reasons and action one thinks are right to improve. Misbehaving is one of the intolerable incidents in any organization. 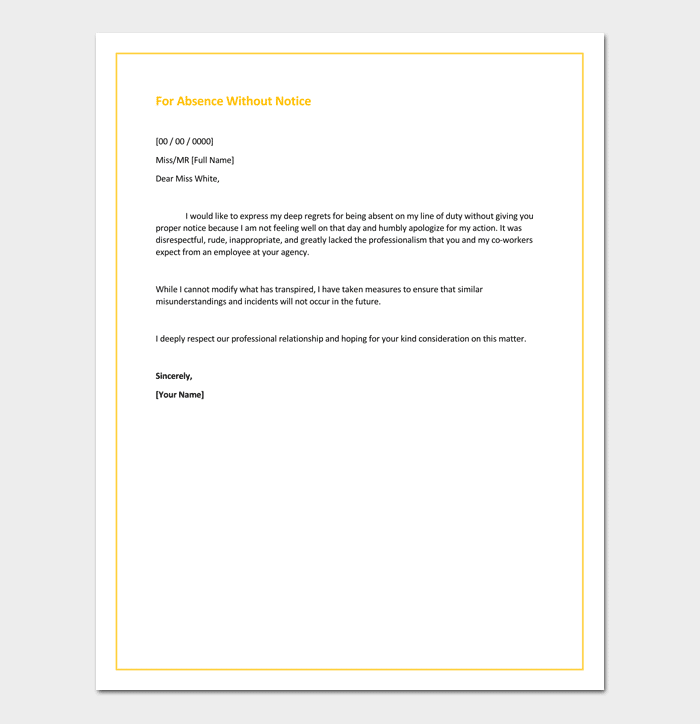 This letter describes the behaviors and seek to be given a room to improve. It usually comes as a request for the record and thus should be well addressed, dated, employee details and sign. Absenteeism may be accepted only if a genuine reason is availed. It is understood that life is full of challenges and at times it affects even the employed. This letter states the reason for absenteeism, measures to consider in future if such a thing arises and provide an evidence to it like medical records, fees structure and other records. This is a behavior that is never allowed in an organization. 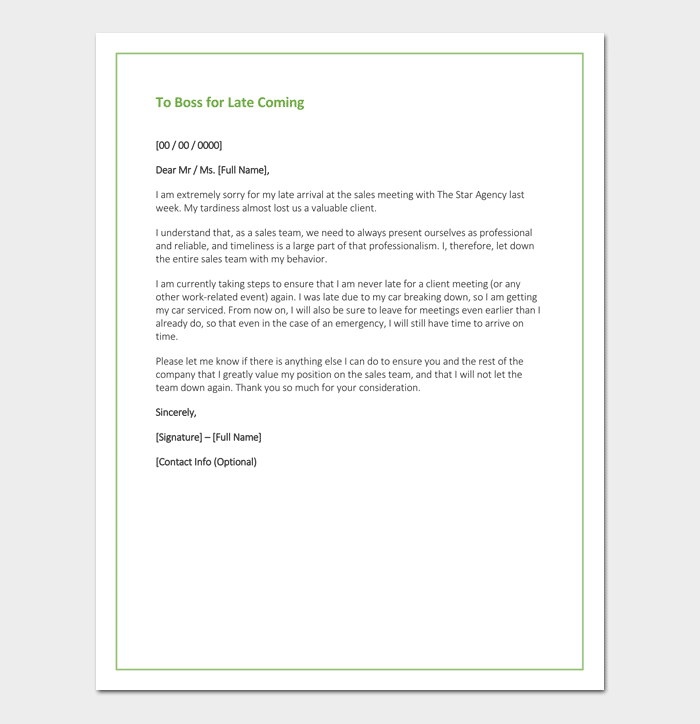 This letter marks the behavior details and can be cross checked when checking for individual performance.It should describe the reason and measures underway to curb being late for work. Misconduct is doing the contrary of the organization rules and regulations. This letter covers the misconduct in question, gives a bearing promise for it never to happen again. As a matter of record, it could be copied across the department and management for reference. It acts as a proof in case of Termination of contract or dismissal. Situation arise and employee find it tough especially where the set guidelines and rules are not adhered to. 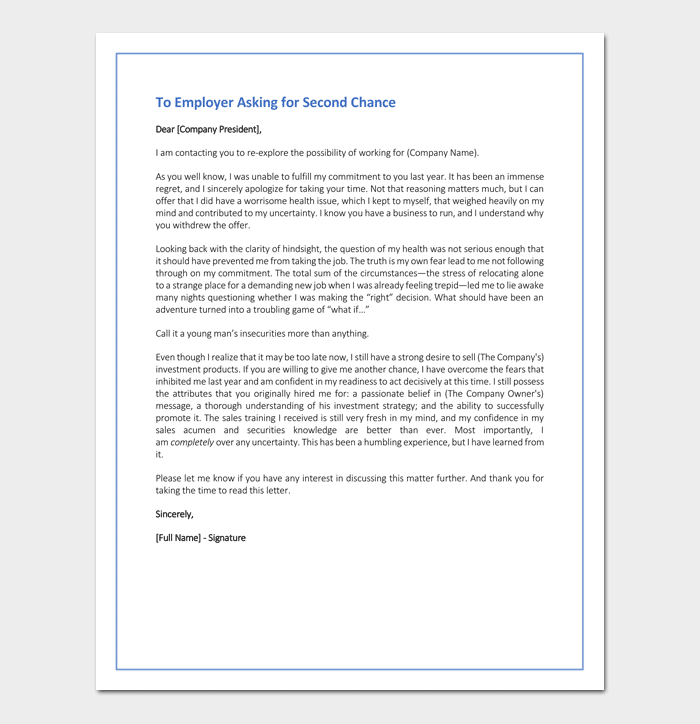 In order to keep a record and for employment consideration, this letter may be required. It seeks a second chance and lays down the expectation that if not followed further action can be taken. It can be copied across the management or department in which one belongs. This should capture the reasons behind being late, if it’s not a frequent behavior, you can seek to get a well formulated approach to handle it. It should be official and well addressed including the Employment details. Rudeness is a behavior of boastfulness, and lack of respect to the appropriate person. To apologies, could include one promise to respect authority, have good and proper communication, and promise action in case if a repeated behavior. This should capture all reasons for the poor performance. With detailed explanation, it should be done to the relevant authorities. This should include the appropriation use of resources/funds. Performance per section and if individually it should be stated. What is expected in future and measures to be taken in case of the continued performance.